Chick Lit Central: Molly Shapiro shares a "heart" warming recipe, as well as her debut novel! Molly Shapiro shares a "heart" warming recipe, as well as her debut novel! We are excited to have with us today Molly Shapiro, and her debut novel "Point, Click, Love," which was just released on December 20th. Molly grew up in Kansas City, Missouri. She graduated from Brown University with a bachelor's in semiotics, and in addition studied creative writing, pottery and film making. After studying abroad in Rome, she returned to the states and started working at a New York City film production company. After graduating from Columbia University's creative writing program, Molly wrote "Eternal City," a book of short stores, which won the Willa Cather Fiction Prize. Molly lives in Kansas City with her two children. To learn more about Molly, visit her website, Facebook and Twitter pages. Thanks to Random House, we have FIVE e-books of "Point, Click, Love" for some lucky readers anywhere in the world! 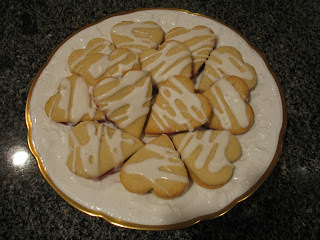 I love these heart-shaped raspberry-filled cookies because they’re both pretty and delicious. They’re perfect for the holidays and are popular with kids and adults alike. The recipe comes from my mom, who’s an amazing cook and taught me everything I know. In fact, whenever I make one of her recipes, I end up calling her 17 times during the process, just to make sure it turns out exactly like hers. And the great thing about my mom is that she never gets annoyed when I call, or at least she doesn’t let on that she is! I was inspired to write Point, Click, Love because of my own divorce and experience with online dating. I wanted to write something that really tackled all the craziness of love and relationships in the digital age. So I wrote about texting and Twitter and tawdry celebrity Web sites—all of those fun things that have become such an integral part of our daily lives. The book’s four female characters cover the gamut—from happily divorced to miserably married to achingly single. There’s something for the divorcee who’s secretly looking for love online, the wife who’s tired of competing with Facebook for her husband’s attention, and the never-been-married professional who’s given up on men and wants to find a sperm donor on the Internet. I hope you like the book—and the cookies! Happy Holidays! Cream ⅔ cup shortening and ¾ cup granulated sugar. Add 1 egg and 1 teaspoon vanilla. Beat well. Sift together 2 cups sifted all-purpose flour, 1½ teaspoons baking powder, and ¼ teaspoon salt. Stir into creamed mixture. Add 4 teaspoons milk. Divide dough in half and chill for 1 hour. On a surface lightly sprinkled with confectioners’ sugar, roll the dough to ⅛-inch thickness. Cut out cookies with a heart-shaped cookie cutter. Bake on greased cookie sheet at 375 degrees for 7 to 10 minutes. Cool. Spread half of cookies with raspberry jam. Make an icing by whisking together 1 cup powdered sugar with 3 tablespoons half and half. Drizzle icing over the remaining cookies and press them on top of the raspberry cookies to make a little sandwich. Special thanks to Molly for sharing her recipe and to Random House for sharing Molly's debut novel! 1. Please tell us: Since this is our last giveaway before 2012, what are you doing to ring in the new year? Giveaway ends January 4th at midnight EST. I will be watching the ball drop at home and then going to bed. I'll be watching the New Year's celebrations on television. I would love to win this giveaway, as the book sounds incredibly intriguing! You can contact me at alexalovesbooks at gmail dot com. 1. I'm ringing in the New Year with some family and friends at home. We're going to stuff ourselves silly with good food, and watch all the celebrations all over the world! I'll also be Skyping with my family in the Philippines. 2. I follow the blog via GFC. As a KC girl myself, I'll have to check this one out! We usually do a Wii game night and stay in. I'm a blog follower and FB follower. I'm having a somewhat boring new year. Staying home with hubby and kids. I'm a follower. Bonus- We don't have plans at this point! We will play it by ear, but wherever we're going, the kids are going too! We are just spending a low key New Years at home. Sounds like a novel I can relate to! I will be ringing in the new year on my yoga mat. Taking a 2 hour yoga workshop from 10 to midnight. Since this is our last giveaway before 2012, what are you doing to ring in the new year? I really, really want to win this one!! I'll be out to dinner tonight! I'm at home watching the ball drop. I will stay at home with hubby and babysit our 2 grandchildren so their parents can go out and make New Year's memories. Oh, online dating...what a topic to tackle! I'd love to read this! For NYE, I had snacks and movies with my BFF and my son, who came home after 3 years away! What a great holiday this has been! To bring in the new year I went to a friend's house and let the kids play while the adults played the wii and the xbox while drinking and pigging out. We all had a sleepover so no drinking and driving would be happening! I was at my sisters for the celebration. Since she has no working radio in her flat we went outside and turned our car-radios on and listened to the countdown, the ringing of the big bell at St.Stephans Cathedral in the city centre of Vienna and "The blue Danube" waltz - the way to get into the new year here in Austria. We waltzed on the street, had some sprakling wine and watched fireworks. I hung out at my bf's restaurant where at midnight everyone had sausages and lentils, an Italian tradition. I watched the ball drop from home! Love to read this one!! I think this sounds like a another great read! Given it is 2012 when I have finally found time to enter this great giveaway....I was in bed by 9 with 2 out three kids sick! 2012 has to get better, right? Interesting , this is very nice i will be very happy if i could win a copy of this book hope if could win a copy of this .